According to a new AAA survey, an estimated 20 million Americans who purchased a real holiday tree in the last three years did not properly secure it to their vehicle, risking serious vehicle damage, dangerous road debris, and hefty fines. With that, AAA East Central is urging all drivers to transport their holiday trees safely this holiday season. Holiday trees that are not properly secured are a safety hazard for other drivers. According to the AAA Foundation for Traffic Safety, road debris – which could include objects like improperly secured Holiday trees that fly off cars, landing on the road or on other cars – was responsible for more than 200,000 crashes that resulted in 39,000 injuries and 500 deaths over the past four years. About two-thirds of debris-related crashes are the result of improperly secured items falling from a vehicle. Drivers can face hefty fines and penalties as well as jail time if an unsecured tree falls off their vehicle. Currently, every state has laws that make it illegal for items to fall from a vehicle while on the road. Most states’ penalties result in fines ranging from $10 and $5,000, with at least 16 states listing jail as a possible punishment for offenders. Additionally, twine that is wrapped around trees and looped through door jambs or open windows can cause serious damage to door seals and window frames, which could cost up to $1,500 to repair. Use the right vehicle. It’s best to transport a Holiday tree on top of a vehicle equipped with a roof rack. However, if you do not have a roof rack, use the bed of a pickup truck, or an SUV, van or minivan that can fit the tree inside with all doors closed. Use quality tie downs. Bring strong rope or nylon ratchet straps to secure the tree to your vehicle’s roof rack. Avoid the lightweight twine offered by many tree lots. Protect the tree. Have the tree wrapped in netting before loading it. If netting is unavailable, secure loose branches with rope or twine. Protect your vehicle. Use an old blanket to prevent paint scratches and protect the vehicle finish. Point the trunk towards the front. 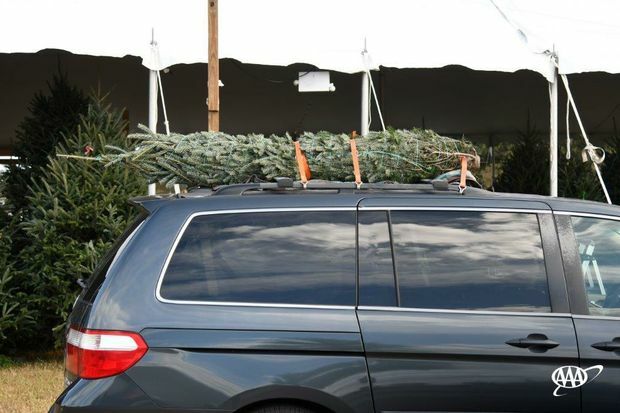 Always place the tree on a roof rack or in a pickup bed with the bottom of the trunk facing the front of the vehicle. Tie it down. Secure the tree at its bottom, center and top. At the bottom, use fixed vehicle tie-down points and loop around the trunk above a lower branch, to prevent any side-to-side or front-to-rear movement. The center and top tie downs should be installed in a similar manner. Give it the tug test. Before you leave the lot, give the tree several strong tugs from various directions to make sure it is secured in place and will not blow away. Drive slowly and easily. Take the back roads, if possible. Higher speeds create significant airflow that can damage your Holiday tree and challenge even the best tie-down methods.